LOCATION !! LOCATION !! * * * DO NOT MISS OUT ON THIS DEL ORO GROVES BEAUTY * * *STUNNING NEWLY RENOVATED HOME ON A OVERSIZE LOT ! SPACIOUS OPEN FLOOR PLAN. EXTERIOR UPDATES INCLUDE - NEW Roof, NEW CENTRAL HEAT / A/C , NEW HURRICANE IMPACT WINDOWS AND DOORS , NEW Exterior paint. NEW Sod and Paver Driveway. INTERIOR UPDATES INCLUDE -NEW PORCELAIN PLANK TILE FLOORING throughout. NEW Interior paint, NEW Doors and trim, NEW Lighting fixtures and ceiling fans, BEAUTIFUL NEW KITCHEN with large ISLAND , New Stainless Steel Appliances and Quartz Counter Tops and 3 NEW Bathrooms. Inside Laundry Room. The yard is HUGE and the back is completely FENCED. With the property consisting of 3 - full sized lots, there is plenty of room for the 4 legged poochies to run around chasing the squirrels. Amazing low maintenance Indoor/ Outdoor Pool . 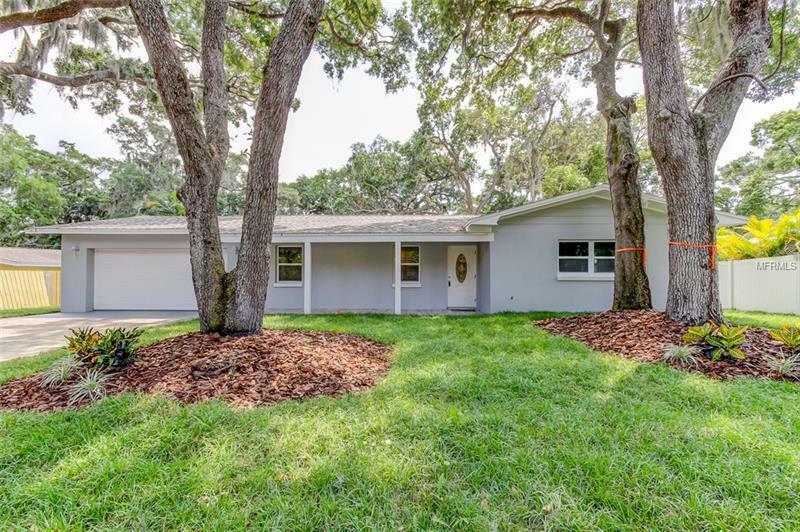 Walking distance to Safety Harbor Parks and Biking Trails. Easy access to Tampa Airport, St Pete/Clearwater Airport and the Best Beaches ! Just minutes to downtown Safety Harbor with it's"happening" list of many events and restaurants/Bars. FLOOD INSURANCE IS NOT REQUIRED. DON'T WAIT ON THIS ONE !